According to the San Diego Museum of Man, San Diego County has more Native American reservations than any other county in the U.S., over 20,000 Native Americans in 13 different bands that live on reservations collectively known as the Kumeyaay. The 13 bands share similar Yuman-based languages, but vary in their regional dialects. Archaeologists say the Kumeyaay have inhabited what is today San Diego County for at least 10,000 years. Kumeyaay settlements also extended into Baja California. 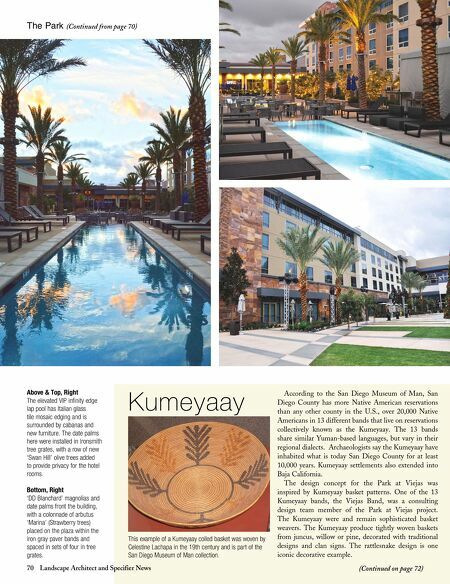 The design concept for the Park at Viejas was inspired by Kumeyaay basket patterns. One of the 13 Kumeyaay bands, the Viejas Band, was a consulting design team member of the Park at Viejas project. The Kumeyaay were and remain sophisticated basket weavers. The Kumeyaay produce tightly woven baskets from juncus, willow or pine, decorated with traditional designs and clan signs. The rattlesnake design is one iconic decorative example. Kumeyaay This example of a Kumeyaay coiled basket was woven by Celestine Lachapa in the 19th century and is part of the San Diego Museum of Man collection. 70 Landscape Architect and Specifier News (Continued on page 72) The Park (Continued from page 70) Above & Top, Right The elevated VIP infinity edge lap pool has Italian glass tile mosaic edging and is surrounded by cabanas and new furniture. The date palms here were installed in Ironsmith tree grates, with a row of new 'Swan Hill' olive trees added to provide privacy for the hotel rooms. Bottom, Right 'DD Blanchard' magnolias and date palms front the building, with a colonnade of arbutus 'Marina' (Strawberry trees) placed on the plaza within the iron gray paver bands and spaced in sets of four in tree grates.